More time saved in making calculations and more time to... think! 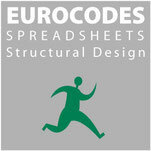 EUROCODES Spreadsheets need Microsoft® Excel® 20032007/2010/2013/2016 as the default installation on both 32bit and 64bit Microsoft® Windows®. 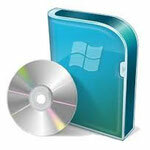 Spreadsheets are compatible with both 32- and 64-bit versions of Microsoft® Office®. EUROCODES Spreadsheets are not compatible with Linux/UNIX® and Apple® platforms. Remark: If you are running WIN10, spreadsheets in "Read-Only" could not work properly! EUROCODES Spreadsheets software tryouts now. Sec. 7 - Sec. 7.4 Free-standing walls, parapets, fences and signboards. Sec. 7.4.2 Shelter factors for walls and fences. Sec. 7.4.3 Signboards. Sec. 7 - Sec. 7.11 Lattice structures and scaffoldings. Sec. 8 Wind actions on bridges. Sec. 8.3 Force coefficients. Sec. 8.3.1 Force coefficients in x-direction (general method). Sec. 8.3.2 Force in x-direction - Simplified Method. Sec. 8.3.3 Wind forces on bridge decks in z-direction. Sec. 8.3.4 Wind forces on bridge decks in y-direction. Sec. 5 Roof shape coefficients. Sec. 5.3.2 Monopitch roofs. Sec. 5.3.3 Pitched roofs. Sec. 5.3.4 Multi-span roofs. Sec. 5.1 Nature of the load. Sec. 5.3.5 Cylindrical roofs. Sec. 5.3.6 Roof abutting and close to taller construction works. Sec. 6 - Local effects - Sec. 6.2 Drifting at projections and obstructions. Sec. 6.3 Snow overhanging the edge of a roof. Sec. 6.4 Snow loads on snowguards and other obstacles. Annex A - Normative - Design situations and load arrangements to be used for different locations. Annex B - Normative - Snow load shape coefficients for exceptional snow drift. Sec. B.2 Multi-span roofs. Sec. B.3 Roofs abutting and close to taller structures. Sec. B.4 Roofs where drifting occurs at projections and parapets. Annex C - Informative - European ground snow load maps. (Expression characteristic snow load on the ground vs Climatic region). Sec. 4.3, Sec. 5.2 - Snow load on roofs (Sec. 5.2(3)P). Annex D - Informative - Adjustment of the ground snow load according to return period. Sec. 4.2 Basic values. Sec. 4.3 Mean wind. Sec. 4.3.2 Terrain roughness. Sec. 4.3.1 Variation with height. Sec. 4.4 Wind turbolence. Sec. 4.5 Peak velocity pressure (basic velocity pressure, exposure factor). UK National Annex - Fundamental value of the basic wind velocity. Sec. 7.2 Pressure coefficients for building. Sec. 7.2.2 Vertical walls of rectangular plan buildings. Sec. 7.12 Asymmetric and counteracting pressure and forces. Questa, dell'ing. Carlo Sigmund, è un'ottima iniziativa in grado di aiutare chi si occupa di strutture nella quotidianità: la scelta degli argomenti trattati, la professionalità e la completezza con cui sono stati sviscerati, ne fanno sicuramente un prodotto di alto livello ed ottima fattura. Utile lavoro e buona l'idea dell'informatizzazione del testo della norma con la possibilità di eseguire in automatico tutte le formulazioni dell'EC variando l'input. Tempo risparmiato. Complimenti per la parte dedicata all'incendio. Bravi! The software is very comprehensive. It is organized per Eurocode, and of every Eurocode it contains all the subcodes and annexes. There's nothing left to the designer to go and look up in the code. In fact, for all that is programmed, the sheets function as an interactive version of the code. Ottimo materiale, consigliato a tutti! 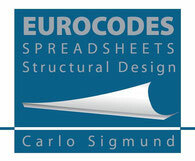 EUROCODES Spreadsheets Structural Design - Carlo Sigmund ©2014 All rights reserved.